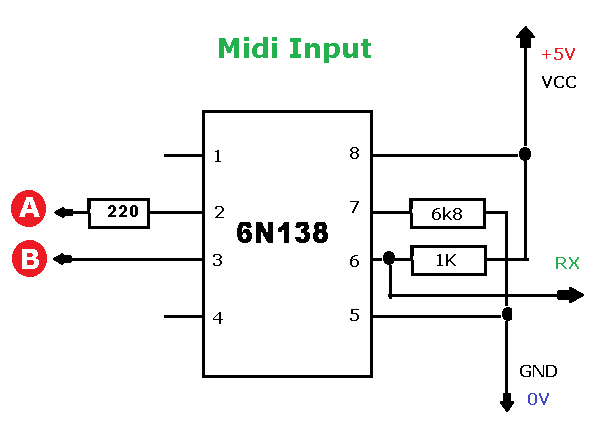 Using Midi Softbits, programming the Arduino to process midi data is straight forward. // which sets of bits we want to use. // this function is only called once after a reset. // this function is called 1000s of times a second. input_midi();  // read midi data. 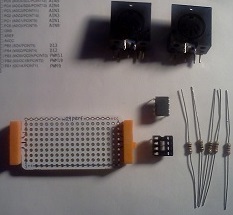 The Midi Interface is a module that allows the LittleBits Arduino Bit to communicate with other Midi devices such as keyboards and computers. This Midi interface was built on a LittleBits Perf Bit. Opto Isolator. An opto isolator contains an LED and a photo detector. Between the two is a gap that isolates the two parts electrically. The perf bits is desgined for prototyping circuits. 2 x 5 pin Din sockets. 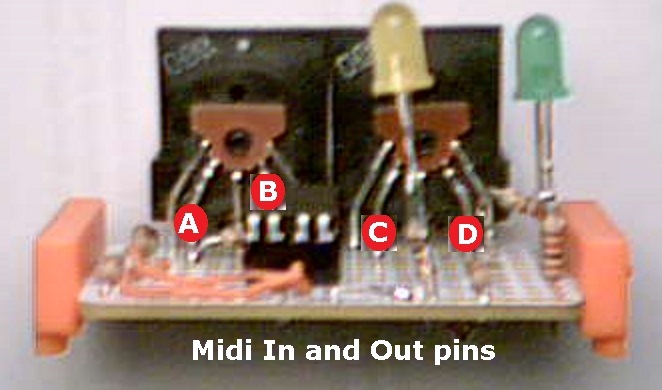 Midi only uses 2 of the pins. 1 x 8 pin IC sockets. For the 6N138. 2 x LED. Used to show power and transmit activity. 2 x 1K ohm. Used to limit the current through the LEDs. Midi Softbits are a library of Softbits that allow the Arduino to process and generate Midi data. Setup for Midi data processing. The dev value selects a 'midi device'. 0 selects the Rx/Tx interface. 1 selects the USB serial interface. Read and process Midi data from the selected devices. The Midi data bytes are decoded to messages such as note on and note off. The messages are put into a queue. Each call to input_midi() will try and read all the available midi data before returning. The first message is removed from the queue and put into global variables for the other midibits to use. If the message is a note on or note off, then the value of the current chain will be set to the note value. Read the a0 analog input. Output is any value from 0 to 255. Read the a1 analog input. Output is any value from 0 to 255. Output to d5 as analog output. Output is any value from 0v to +5v. Output to d9 as analog output. Output is any value from 0v to +5v. The gate value is 0 if no note is playing or 255 if a note is on. The value is sent to the specified chain's start value. Midi note on messages contain both the note being played and if the 'keyboard' supports it the velocity of the key. The faster (harder) the key is pressed the larger the number. A velocity of 0 has a special meaning of note off. The value is sent to the specified chain's start value. 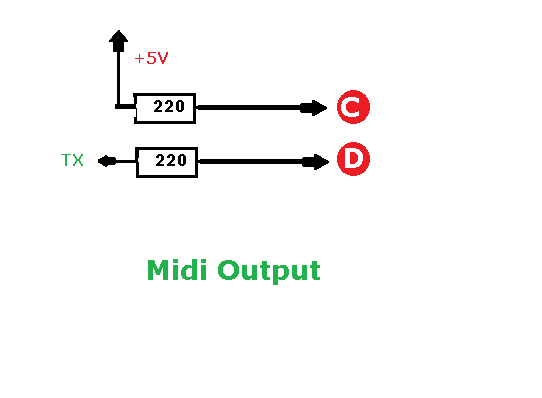 Midi supports many controllers. When a controller is changed it sends a Control Change message. The message specifies which controller was changed and what the value is. The ctrl parameter specifies the controller to look for and the send parameter specifies the softbits chain number to send it to. env_attack implements the Attack part of an envelope generator. When the input is high ( greater than 128 ) then the attack bit will increase the envelope value using the current value of the specified chain. When the envelope value hits it's maximum, the attack bit will switch to the next bit in the generator is one is specified. If during the attack phase, the input value goes low then the attack phase will end immediately and pass on to the next envelope bit. env_release implements the Release part of an envelope generator. When the input is low ( less than 128 ) when activated, the release bit will decrease the envelope value using the current value of the specified chain. When the envelope value reaches 0, the envelope cycle ends. If during the release phase, the input value goes high then the release phase will end immediately. env_value sets the current chain value to the envelope value. 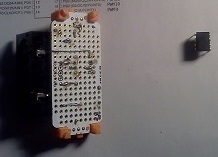 Source of the Softbits Midi Sketch that is loaded onto the LittleBits Arduino module. 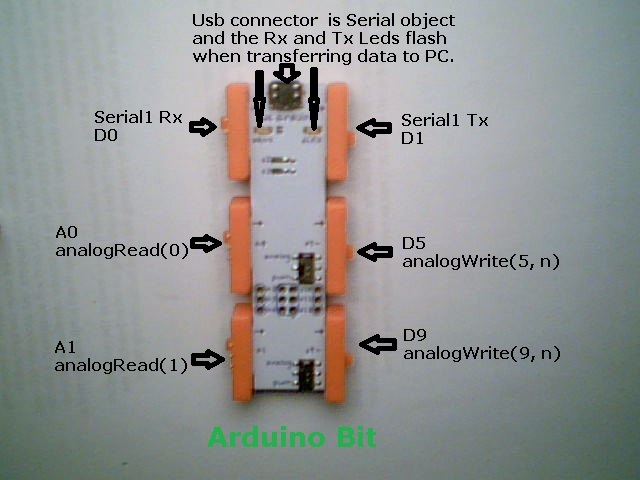 This source can be configured for both the LittleBits Arduino 'Bit' which is an "Arduino Leonardo" board type or an "Arduino UNO" style board. Make a folder called softmidi and copy these files into it. Open the Arduino IDE and select the folder you just created using the File/Sketchbook menu. These files were last updated 11/16/2014.